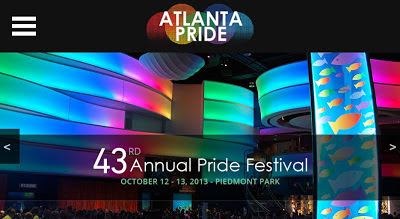 Four years ago, Atlanta stopped holding its annual Pride celebration in June. Georgia was suffering from a severe drought at the time and in order to keep the event in Piedmont Park while preventing undue stress to the grass and landscaping, it was decided to move Atlanta Pride to October. I've been very happy with this change. Not only is the weather usually more comfortable in October, it moves our celebration away from the traditional month of June when most other cities' Pride celebrations are being held. Along with this calendar change, the Pride weekend kick-off party was moved to the Georgia Aquarium which is perfectly suited to hosting such a large event. The fish don't seem to mind, and I think the beluga whale rather enjoys showing off his junk to a crowd that seems more appreciative than the usual daytime crowd of families with small children. Last year I didn't plan ahead and missed getting tickets to the kick-off party before they sold out. I'm not going to let that happen again this year. I just pre-ordered tickets for myself, plus some extras for a few guests. If you recently enjoyed Pride in your city, why wait a whole year to celebrate again? Now's a good time to start planning a visit to Atlanta! hmm...one of my best friends just move to Atlanta. I could see him and meet you.